If you are a business owner or property manager, you may be looking at the prospect of updating your old, outdated interior. This is essential for striking a quality first impression for your guests and clients. Additionally, an updated interior will provide a number of benefits for your employees. It falls on you to secure the best outcome for your business while staying within time and budgetary restraints. When it comes to drywall installation and wall finishing in Chicago, you’ll find a large number of contractors available to deliver the services you need. There is a risk, though, that your commercial drywall contractors will be unable to deliver the level of service that your business needs. AZ Drywall Finishing is here to help. Since 1999, our commercial drywall company has worked diligently to deliver the best results for businesses all across Illinois. Hiring the right team for your project can make a big difference once the dust settles (and is swept up!). Today, we’ll continue to highlight the benefits of using our drywall contractors for all of your wall finishing and renovation needs. Drywall installation can be an intensive process, so be sure to reach out to our experts before starting your project! Dust and silica. Gypsum plaster is a durable and cost-effective material, but sanding and cutting can generate hazardous airborne pollutants. Our team relies on MSDS specifications to ensure that everyone in the vicinity follows the proper precautions. Additionally, our drywall finishers will section off any areas under construction to keep your employees and guests safe. We also utilize proper dust mitigation techniques for further protection. Tripping hazards. Employees, contractors, and guests alike are all at risk for tripping dangers during a renovation project. It can be too easy to leave materials at ground level throughout the day. At any point, obstructed pathways are a high-risk scenario, especially if a passerby is not paying attention. Our team focuses on safety at all times, working diligently to minimize scrap and other tripping hazards that can result in injury. Exposed dangers. 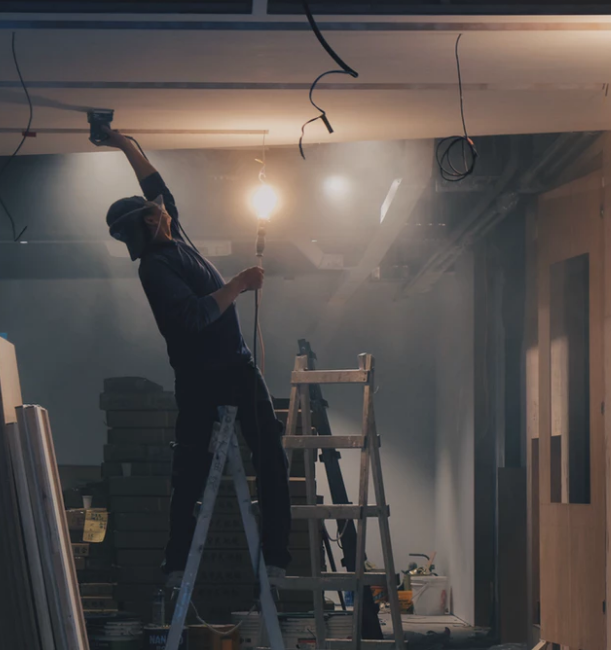 The process of drywall installation in an occupied space results in certain environmental hazards that can prove very dangerous if not properly mitigated. Sharp edges, unsecured materials, and exposed wiring can all create a dangerous environment in your building. Our drywall contractors are all OSHA-trained and up to speed on the most modern practices for minimizing any dangers on the site. We’ll put in the effort to ensure that your employees and guests are at minimal danger at all times. Tools and equipment. While it may not sound likely that an individual on your property will come into contact with drywall tools and sustain an injury, it does happen. Our drywall finishers go through continual training to keep them informed and aware of any dangers during work hours and beyond. When we leave, you can rest assured that all of our tools and materials are properly secured to avoid any mishaps. Our team is focused on delivering the best results with a spotless safety record. We are licensed and insured, but that does not mean that we take the safety of everyone in the building any less seriously. Investing in renovations such as professional wall finishing and painting services can be a stressful experience if the quality of the results rests on your shoulders. AZ Drywall Finishing is here to help put your mind at ease, focusing on meeting your needs while completing the job on time and on budget. Our experience and dedication to the highest training standards ensure that you are satisfied with the outcome. If you aren’t absolutely satisfied, we’ll work hard to get it done right. We’re confident in our experience and versatility when it comes to delivering quality results. Not sure about our results? Check out our project gallery to see the AZ team in action. You can also read a few of our testimonials to catch up on firsthand experiences from our satisfied customers. Our commercial drywall contractors are here to work with you every step of the way, delivering clear lines of communication and honest, reliable assistance for any foreseeable issues. From our first bid to the last drop of paint, you’re sure to receive peace of mind through the entire process. We rely on the highest quality products, materials, and practices to ensure consistency in our high value of work. 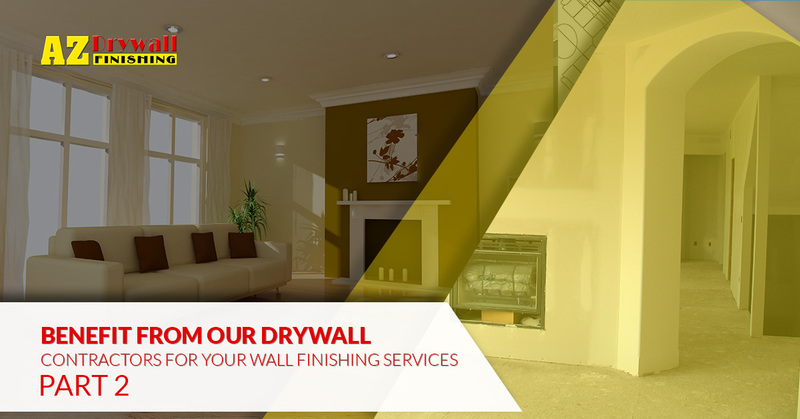 AZ Drywall Finishing is proud to be your trusted team for commercial drywall installation and wall finishing in Chicago, providing customized solutions to ensure the best results for your business. No matter your needs, our drywall company can work to optimize the results in any way we can. Contact us today to learn more or to receive an accurate quote for your renovation or addition!